If there is a moment of emotional inflection during the wedding day, it has to be the first kiss. Truth be told, the first kiss at this Liberty Grand wedding was unique. I often see rehearsed kisses, accompanied by dips, victory signs, fist pumping in the air and other forms of expression more or less genuine. However, this particular first kiss that occurred during the outdoor ceremony at this splendid event space, was one of a kind. I have to preface my observations by stating that this case is a symbol of the symbiosis between various nationalities, an expression of tolerance that can be found mainly in Canada in particular in North America in general. The groom is of Italian descent and the bride is from Jordan. As such, the kiss symbolizes the marriage between cultures in harmonious cohabitation, something so prevalent in the Greater Toronto Area. While the wedding officiant was from Jordan, the couple insisted that they had a symbolic wedding ceremony. It is very's common in a multicultural city like Toronto to see such so-called fusion weddings where the bride and groom come often from various corners of the world. 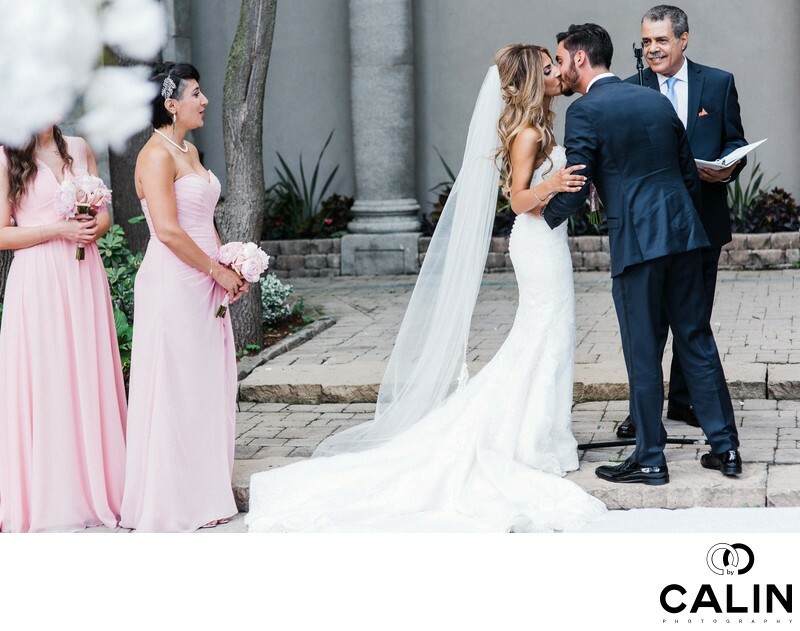 This first kiss tells the world that the power of love crosses borders and obstacles and on a big day everybody forgets about their origins in focus on the birth of this new family established by the bride and groom. As a side note, about 50% of my weddings are so-called fusion which is representative to the population of this metropolitan area where 50% of the people were born outside Canada.